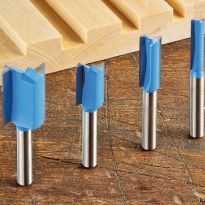 Cut grooves, dados and rabbets with these precision ground carbide straight bits. 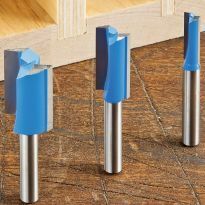 One of the most common router bits, straight router bits are used to cut grooves, dadoes, rabbets, and for general purpose material removal. They are also capable of cutting mortises. 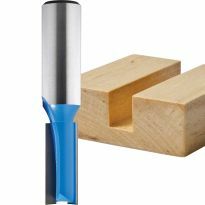 Each bit has two carbide flutes that are precision ground for the smoothest possible cuts, and a long cutting life with minimal sharpening. 1/4" shanks. A good bit that makes a clean cut. re-dimensioning without saw, jointer or planer. Had to take 1/8" off 2 sides of 2 X 2 select pine, worked fine. made 41 balusters to match 31 year old existing ones. Bits are of good quality, worked well. Used for multiple dado cuts. Did not seem to dull at all. Should have gone to Rockler first! After purchasing two Vermont American router bits from local hardware store and having one melt and break and the second go dull after just two 25" pieces I went to see the experts at Rockler. They explained that a one-flute bit wasn't going to get the job done and provided me with a two-flute bit that worked like a charm. Finished routing about 18 board feet and the bit was still performing perfectly. Learned my lesson and will always purchase my bits at Rockler! Works fine and is warranted against breakage and etc. not much else to say. I am not a wood worker but I had a small project to do. I needed to cut a slot in the top of a wooden box. This bit is super sharp and cut the slot perfectly. Used the bit on a small project recently and worked as advertised. Since I admiring some carving in pieces that are some 40 inches long by 24 inches and some 2 inches thick I am using some router cutters that will cut some channels of different depths I have found the router bit to be not only invaluable but also good tools. 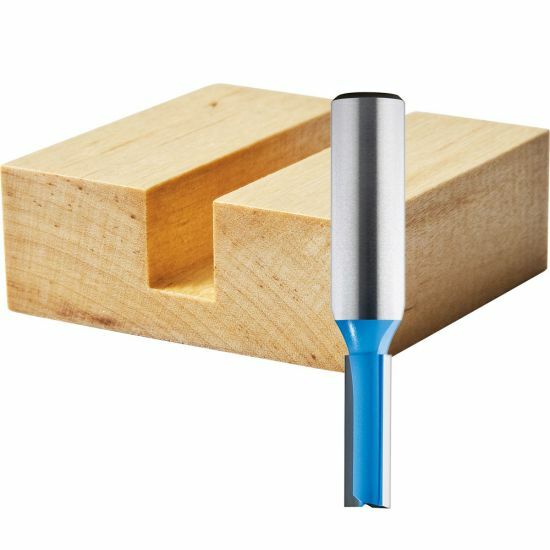 1/4 inch shank router bit! Just what I needed! Works perfect! Used on pine doors but had no problems even with some knots. 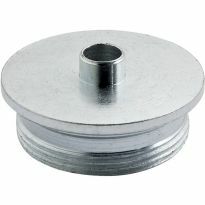 needed a 3/8" bit for the router in my router table, Decided to buy from Rockler since I was here shopping . The bit is nice and sharp and leaves a very nice cut. The one bit i didn't have and the only one I needed for my Jig-it hinge jig. Cuts a clean groove that the cabinet back slides into. 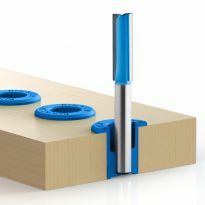 Like all other Rockler bits, it proves it's quality. 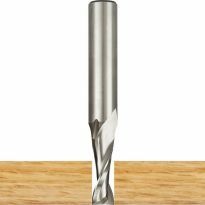 Very clean cutting bit. Very happy with the results from it. Great as usual, haven't had anything from Rockler that I didn't like. good people to do business with. good stuff, fast ship, good communications. With the Rockler hinge jig it I am able to cut mortises more precisely and with more confidence and repeatability for my quadrant hinges. Very nice product. I recommend this for woodworkers who build boxes using quadrant hinges and was t a professional finished look. Bit works great as expected. Thanks Rockler. Should have come with the mortising jig system I bought to use it with. 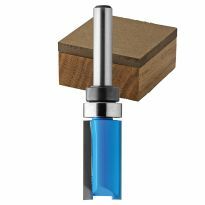 I certainly would recommend this router bit to other woodworkers. 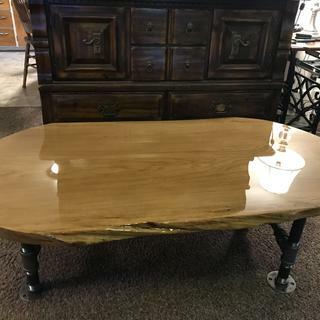 it performed very well on my slab table project. With the addition of the router featherboard kit I purchased, I was able to setup my table router to safely &quot;plane&quot; some 1/8&quot; thick strips of red oak I cut using my thin rip table saw jig. The extra length the Straight Router Bit gave me was just the extra I needed. Thanks Rockler! Great product - For me the longer bit was what I needed. Fine bit. Worked as expected. A bit long however in my PC 690 router. With the standard PC base, I barely had enough router motor housing inside the base to hold it steady. As usual only the best quality products that I have found. Repeat customer and will be as long as I dabble in woodworking. Purchased the 5/8&quot; bit for a specialty inlay flooring job. Outperformed 2 other previosuly used bits by a long shot. Best quality bit I have used in 15 years. I will never go back to another- cut my use time in half. I'm building a router table and this bit was just the thing to tear through my Formica and plywood tabletop. I'll be the first to admit I have to work on my routering skills. This bit was very solid for me and made easy work of a daunting project. This bit made me look good. I don't know how to sharpening a router bit, mine was so bad (dull) . Having this new one working is a totally different experience. I have used this bit three times. Twice in figured maple, once in cherry. 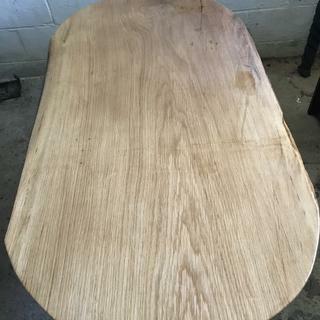 In the maple there was no chipping or ragged edge. On the cherry there was some slight feathering at the top edge of the land on the chip out side. It could have Bern the moisture in the wood as well. This is a pretty good bit. I bought a couple of these small router bits to do a project with oak. I used them in my cnc to do some lettering after a cheaper bit broke. The new bit completed the job with satisfactory results. The price seems about right and Rockler's customer service, as always, was exceptional. The price was excellent and the bits are of high quality. Nice clean dadoes in hardwood. The bit could be longer. I'm using it in a Dewalt plunge router mounted in a table. Not much of the shank is inside the collet to get the depth of cut I need. Quality? More time will tell. I purchased 2 of these bits. The first one was working great and would have received 5 stars, however it snapped just below the shank after routing 8 small circle cuts in MDF. I called and it will be replaced. Good thing I purchased 2 of them as it allowed me to complete the project. Ordered two. Carbide tip fell off the first one upon starting router. Second bit worked well. I have purchased two of the 1/4 inch straight bits with the 1/2inch shaft. The first one broke. I thought it was operator error as I was new to router work. I assumed that I had fed the work bit mounted to router on a router table too fast or took too deep of a cut. The second bit has been babied. It also broke. I cannot recommend this bit. Didn't work well at all. The broke at the collet/shank junction in a CNC operation. broke at less than 4 linear feet at a slow feedspeed. well under the chip calculator ranges. Returned the broken ones for credit and the new unused ones. Because the 1/2" Shank was sold out. 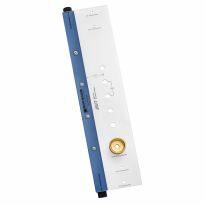 This is to be used in conjunction with the T-Slot Bit. Needed a 7/16" diameter bit for current project. I wanted to have one to use in my trim router. needed a 3/8 in. straight bit with a 1/4 in. shank, was shopping for supplies and saw they were on sale thought I would give it a try. To clear a pocket in a cribbage board for a deck of cards. Used to prep groove for dove tail bit. Because the single fluted bit gave me too much trouble. Learning more about dadoes and my old bit is pretty well trashed. wore out the old one. 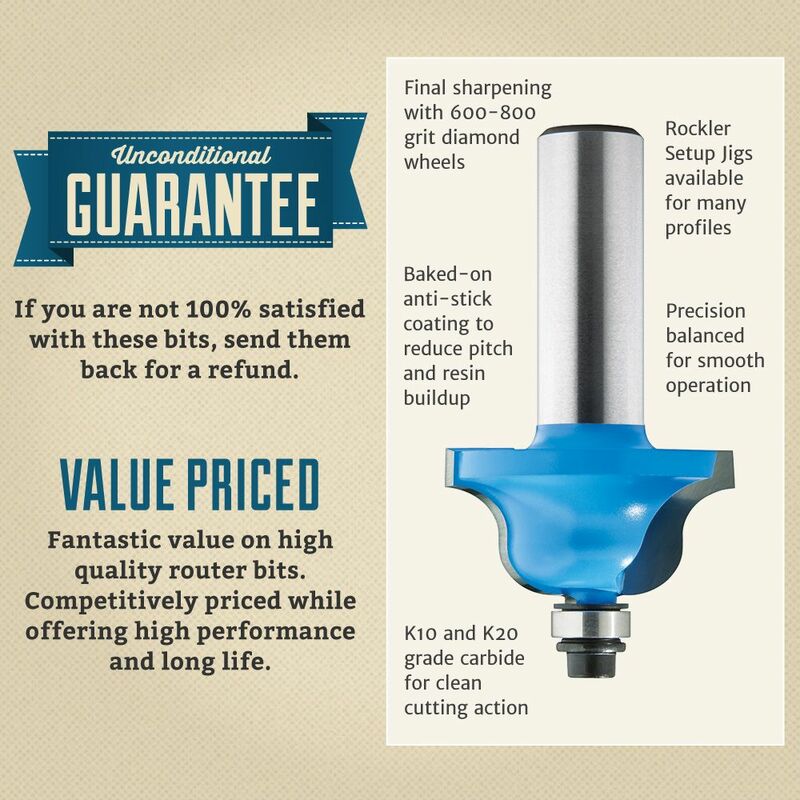 Rockler sells quality router bits. High quality of previous purchase; 20% off made them good buys. your quality and customer satisfaction have been my mainstay for years. Keep it going. By the way, I used the free shipping 7J101 code, but it did not work. Sorry but I need the bit. Gives us a clean, detailed cut through 3 mil sintra and a nice pocket cut in HDPE cutting board material. . I broke three bits trying to route out a hole in some 3/4" hickory and needed to replace them. 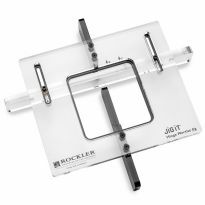 I needed a tool of high quality and I know I can count on Rocker every time. What is the total bit length? what is the total length these bits? I need to create dados for shelves of 1/2 plywood... which is slightly less than 1/2 thick of course. Is the 1/2 bit a full 1/2 in or is it slightly (1/16th?) smaller? BEST ANSWER: It is a true 1/2" if you want to use 1/2" plywood get the under size plywood bit I think they are 15/32 or 31/64ths.just rite for 1/2" ply. What is length of the shaft??? 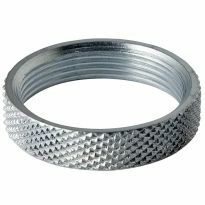 I NEED AT LEAST 1.250 length otherwise I cannot tighten the nut on my plunge router because I am using a guide bushing . 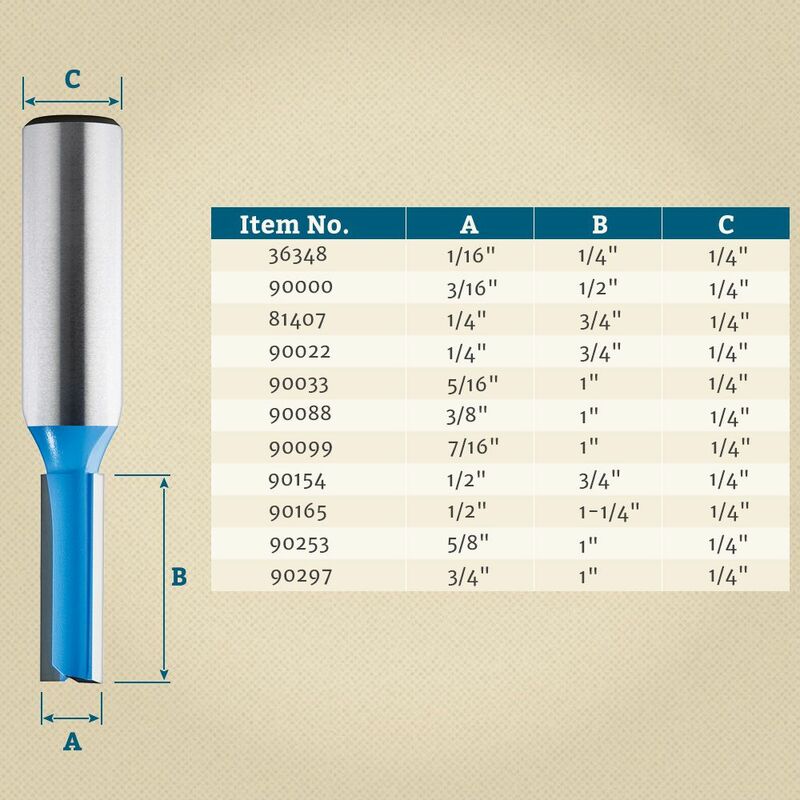 BEST ANSWER: I have the 3/16" diameter bit and the shaft is 1.25" long. in this catalog, is H the total bit length or the blade?